From Formula 1 to touring cars to Superbikes, machinery of all shapes and sizes have turned a wheel on the hallowed racing lines of Brands Hatch’s iconic circuit over the decades but today [30 September] fans attending the Dunlop MSA British Touring Car Championship finale were treated to a lap like never before – by a lawn mower! Then again, this is no ordinary garden tool – this is the Mean Mower V2, Honda’s extraordinary high-performance interpretation of the humble mower, a machine capable of hitting 150mph as easily as it cuts your garden lawn. Built by Team Dynamics, Honda’s partner in the BTCC, and powered by a 999cc four-cylinder unit lifted from Honda’s Fireblade SP motorcycle, fettled to produce 190bhp at 13,000rpm, the Mean Mower V2’s motorsport origins arguably make the race track a fitting spiritual home for this show-stopper. So while the sight of a lawnmower – which retains the traditional look and cutting abilities of a Honda HF 2622 lawn tractor – lining up on the grid was always going to turn heads, it was the Mean Mower V2’s pure power that left spectators awe-struck as professional racer Jess Hawkins hit full throttle. 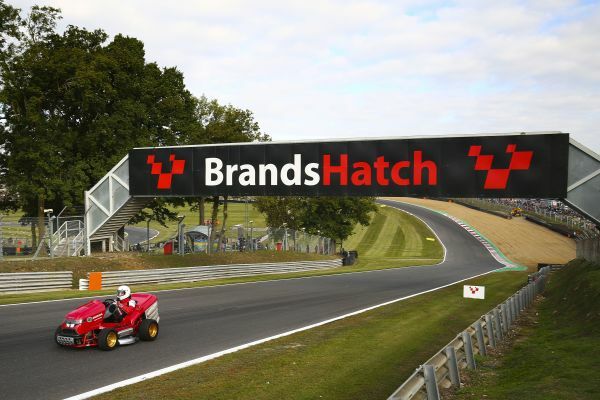 With a power to weight ratio of 1000bhp/tonne making the world-famous plunge into Paddock Hill Bend an experience like no other and the high-tech Honda Fireblade SP clutch, ECU and six-speed drive train launching a slingshot through Clearways, the Mean Mower V2 gives a fine impression of a race-ready contender. Built to demonstrate Honda’s breadth of product offering, sporty credentials and reputation as one of the world’s most innovative companies, the second-generation Mean Mower V2 – launched in July – is a true one-of-its-kind icon. “The relationship between Team Dynamics and Honda has yielded significant successes over the years but the Mean Mower V2 project is an achievement we are especially proud of. It really has to be seen to be believed and today a huge audience got to see just what can achieved when you think outside the box.